Adventure awaits you in 2019. You likely won’t be able to be on vacation every day of the year, but here are 5 easy ways to feel like you are. In addition, you’ll get out of your comfort zone and feel more energized and alive. Adventure awaits you. Choose to make this your year of adventure. You’ll feel like you’re on vacation even when you’re not. And when it is time for a real vacation, you’ll be ready for one of our hiking or wildlife tours. You don’t have to actually go anywhere. Just by adopting a travel mindset and replicating some of the things that you do on vacation can bring you immense joy and happiness! These five adventures will help tide you over until it’s time for your next real vacation when it’s time for the real adventures to begin. You can implement these five adventures in any order that you like. Go as quickly or as slowly as suits you. They’re completely adaptable to what works for you. However, to feel like you’re really on vacation, I recommend doing one a week over the next 5 weeks. Simple right? It is, but most of us take for granted the beauty where we live. When you see the same streets and buildings every day, it’s easy to become immune to the beauty right in front of you. But a key to happiness is appreciating our immediate surroundings. Think about it, if you were visiting Paris for the first time, what’s one of the first things that you’d do? Probably visit the Eiffel Tower for a breathtaking view over the City of Lights. But when’s the last time you did this in your hometown? I know I’m guilty of this. I had lived in Munich, Germany for four years when I asked myself this question. So I decided to climb the 299 steps up to the viewing platform of St. Peter’s Church, the oldest church in Munich. This is something that is in every guide-book! Something that every visitor to Munich does. And it only costs €2! Perhaps, you have no inclination to climb a church tower, or there isn’t a church tower where you live. Instead, seek out a view from a hill, from a rooftop patio, a skyscraper, a tower. Whatever is available to you! Make it easy so that you’ll do it. I really enjoyed doing this and seeing Munich from another perspective made me realize how many red roofs there are. I had no idea before. This adventure gave me a new appreciation for my city. Try bringing the novelty factor into something that you do every day. Multiple times in fact! I’m talking about FOOD. Now, don’t get worried, you don’t have to eat chocolate-covered insects – unless you really want to! I’m personally going to pass on the insects! Challenge yourself to try a new type of food or cuisine. Check out these foodie experiences for inspiration. Yep, that’s right, an eating challenge – one of my personal favourites! What can I say, food makes me happy! You can either whip something up yourself or try a new cuisine at a restaurant of your choice – it’s up to you! I do encourage you to be adventurous though. If you actually were on vacation, you’re likely more adventurous than you are at home, so try to get out of your comfort zone at least a little bit. I.e. if you normally order Spaghetti Carbonara, ordering Spaghetti Bolognese instead isn’t going to bring you out of your comfort zone. Instead, try a new cuisine you haven’t tasted before. Nepalese, Afghanistan, Peruvian, Korean, Caribbean, the choices are endless! Yesterday I went to an Indian restaurant for a business lunch. Admittedly that doesn’t count as adventurous in my book. I eat Indian food at least once a week. However, I always order the same thing – Lamb Palak – nom, nom! I loved trying a dosa, a speciality from southern India. But yesterday, my lunch companion informed me that this was the only Indian restaurant in Munich offering southern Indian food. And, the only place you could get a dosa – a gluten-free crepe stuffed with an assorted filling of potatoes, vegetables or meat. I just HAD to try it! The HUGE crepe arrived hanging over the edges of my plate. It was delicious and gives Lamb Palak a run for its money! I’ve already made another reservation there for next month! I also recently went to a Peruvian restaurant for the first time and loved the ceviche! I didn’t love the traditional blue corn drink but it was still fun to try it. It also changed the conversation I had with my partner as we debated what to order and what to share. It was a great night -both from a cuisine point of view and of doing something new with my partner. A big part of living adventurously and getting outside your comfort zone is sharing experiences with someone else. Additionally, you’ll get the joy of seeing things from another person’s perspective. Perhaps even doing something that you wouldn’t normally do, but you do it because the other person is interested in it. You may even find yourself enjoying it! Recruit a friend, family member, partner, neighbour, or colleague and plan an outing for each other. This means that you’ll be doing two things this weekend, one that you plan and one that your partner in crime plans! You can also spread it over a few weeks if that’s easier. Keep it a secret from each other. The surprise element is a big part of feeling like you’re on vacation – knowing that an adventure awaits. Your activity can be visiting a museum, exploring a new park, trying out a new activity, checking out a new cafe, going to a poetry reading, or seeing a foreign film. Whatever will make you feel like you’re on vacation. Check out Viator or GetYourGuide to see what’s popular for visitors in your city. It’s fun to play tourist in your hometown. The choice is up to you, but try to include a novelty factor in it – something that is new to the both of you to get you out of your comfort zone. This activity brings a double bonus. In addition to doing something new, you get valuable time with someone who is important to you. How often do we think to ourselves, I really should call..so and so. Or I haven’t seen so and so in months. Or my husband and I haven’t been out on a date in months – our “dates nights” are on the sofa watching TV! Me doing my first multi-day cycling trip with a friend. Here is your chance! I’m sure whoever you decide to recruit would love to spend time with you WHILE creating happy lasting memories and feeling like you’re on vacation together. Years later you can reminisce about the time you visited the flea market together and tag-teamed to get the bargain of the century. Or the time you decided to be sophisticated and attended a poetry reading and left for a wine bar instead when you realized you didn’t understand a single stanza! For me, it was going to a trampoline park that had just opened with close friends. We laughed so much and have vowed to do it whenever we start to take ourselves or life too seriously. One of the things we sometimes experience when we’re on vacation is fear – quite the opposite of the happy feeling that we’re hoping to feel! Now wait a minute, you might be thinking, going on vacation is supposed to make me happy! But hear me out, travel can be scary! Travelling to a country where you don’t speak the language, and wondering Will anyone speak English? is a very frightening thought. Heck sometimes even figuring out how to get from the airport to your hotel can be a fear-inducing experience. Besides the language issue, many destinations you have to fly to. And ~ 25 million Americans are afraid of flying. There’s also the fear of unfamiliar food. What if I think I’m ordering a steak, but end up ordering fermented whale meat instead? Or Will I get salmonella from eating the chicken from a street vendor? Or Was my salad washed with contaminated water? Anything that’s unknown can be scary. That’s true even if we believe the rewards trump the fear, as in travel. But facing our fears makes it easier to stand up to our fears and it gives us confidence and happiness in other areas of our lives. It’s one of the reasons that I believe that a long distance hiking trip can change your life. That’s why this activity is to do something that scares you or takes you on a brand new adventure. Choose something that just thinking about it makes you shake in your boots! Maybe it’s belting out karaoke (one of my worst fears since I’m tone-deaf). Going to a zoo and staring at the snakes and spiders. Taking the elevator to the top floor and looking out if you’re afraid of heights. Or giving a presentation if even the thought of public speaking makes you sweat! Trust me, afterwards, you will not only be proud, but you’ll also be a happy camper! As to what I did, that scared me? 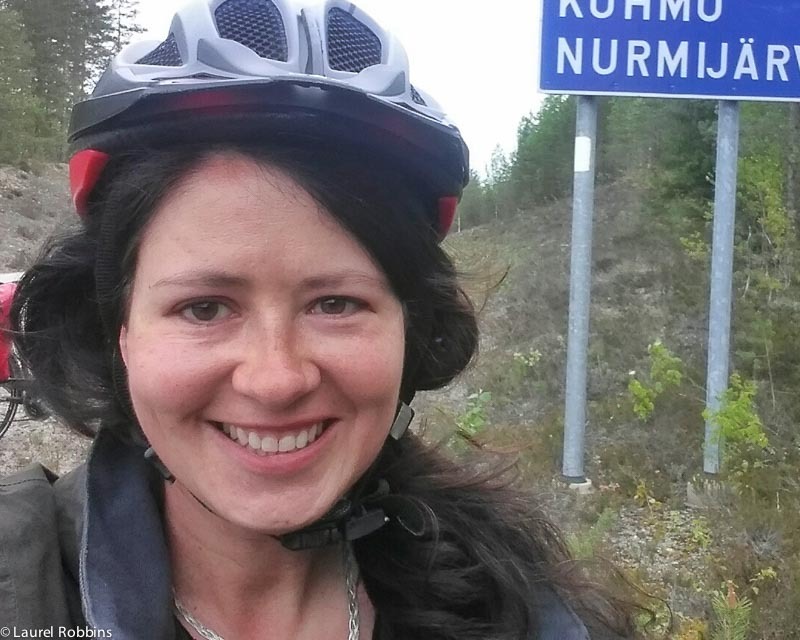 I decided to cycle the Iron Curtain Trail alone, 1200km across Finland! Until 6 weeks before, I had never cycled more than 80km. And my longest cycling trip was 3 days along the Danube River. On this 21 day trip, I cycled 80 to 100km each day. I was also alone. I’ve done long distance hiking trips before like the Tour du Mont Blanc, the 9-days Dana to Petra trek in Jordan, and a 7-day trek in the Dolomites but nothing of this magnitude. I’d seen someone repair a punctured tire, but hadn’t actually attempted it yet myself. And there are bears! There were a lot of fears there, but the fear also made me feel alive. It made me stronger. When I was tired and pushed through, it made me realize that I could do that in other areas of my life as well. Overcoming my fear of Can I actually do this and do it alone? resulted in one of the biggest adventures in my life and one of my proudest accomplishments. One of the things that you’re more likely to do while on vacation is to try a new physical activity. You probably have more of a Why not? attitude than you do at home. So I’m asking you to adopt that same attitude of adventure. I know what you’re thinking, Hello, how is working out going to make me feel like I’m on vacation? I’m not talking about just any regular workout, but trying something you’ve always wanted to, but never have. Check out Viator or GetYourGuide for suggestions of what you can do in your area. As an alternative, you can choose your favourite activity, but try it in a new place if that works better for you! For example, if you’re an avid hiker, you could try hiking in a different region that’s still close to home. Or sign up for the Tour du Mont Blanc, the Dana to Petra trek in Jordan, hiking the Italian Riviera a trek in the Dolomites, or hike from Bologna to Florence. Alternatively, you could also do a mini-getaway packed with different activities like I recently did in Aberdeenshire, Scotland and Zillertal, Austria. 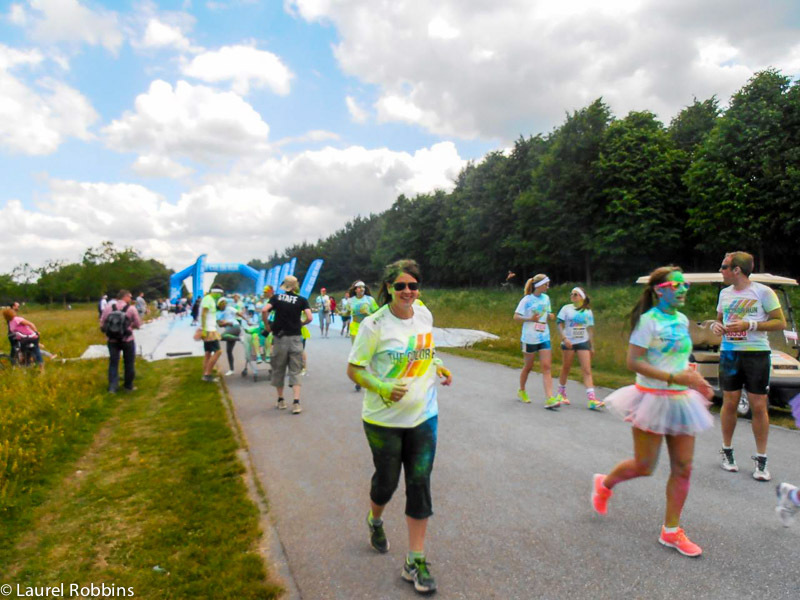 Me running the 5km Color Run in Munich. Last year, I felt that I needed more happiness in my life so I signed up for The Color Run. It calls itself the happiest 5km on the planet! Seriously, who could resist that? It’s a 5km run where at various stations people through coloured chalk on you. I had seen the videos and it looked like everyone was having a fantastic time, so I thought Why not? I ended up covered in chalk and finished with a big smile plastered on my face. Me rappelling for the first time and loving it. 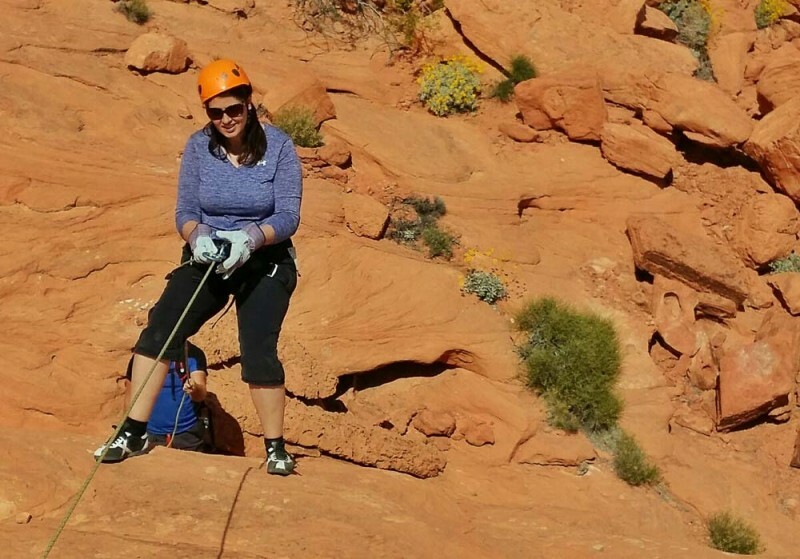 At other times when I’ve been stressed out and in need of a vacation, I’ve tried rappelling and ice-climbing. For me, there’s no better way than trying a new activity to feel like I’m on vacation almost instantaneously. @Aaron, it's a photo of a dosa. Big fan of them, although Lamb palak is still my go to. Laurel, What a great read! I try to do different things as often as possible. Here in Phoenix, Az in the USA, There are many choices for adventure all within an hour or two drive. In the winter here, you can drive north for 2 hours and be in the snow, then drive back to Phoenix and lay by the pool. @Kathy - Glad you enjoyed it and great to hear that you try to do different things as often as possible. Phoenix sounds like a great place to live for experience different adventures.